Okay, so I told you all about my weight gain since graduating in Post Grad 15. Now, I’m going to share with you what may have attributed to that. It started before I graduated back in March or April when the sink and dishwasher in my apartment needed to be fixed. The maintenance man was on vacation for two weeks and we had to eat out every night. With all the choices I had to eat around me I always chose Chic Fila… slowly it grew into an addiction. There’s no other way to put it, I’m addicted. I’ve tried to kick this addiction plenty of times this summer with no luck, so now I just indulge myself. I must have it at least once a week. I find myself driving across town numerous times a week with my friend just to get a fix since moving back to LA. No other chicken joint can compare to its quality, let alone customer service. In honor of the new restaurant opening in Hollywood on Sunset today I thought I would share with you all the reasons why you (yes, you love it too) and I love it so much. 1) Everything on the menu taste superb! You just can’t beat quality. Chic Fila is all about the Quality! There is no doubt in my mind that they use premium chicken breast. I never have any pieces of fat on my chicken like at other places and it always tastes so fresh. The chicken melts in your mouth like butter. It even digest well too. I’ve never heard a bad word even spoken about their menu items nor do I have any complaints. Their milkshakes (pauses at thought). The cookies and cream was my favorite until I tried the peach flavor. That peach shake is like a pool party in my mouth. I literally get sad at the thought of it being gone once I finish. I also get really sad when I finish eating my meal too. Okay, this right here alone was the cherry on top for me once I began my love affair with chic fila. The first time I had an employee tell me “My Pleasure” I really felt appreciated as a customer. Mind you their food isn’t cheap so to get GREAT customer service too is awesome. They also walk around and ask you if you need a refill. I’ve even had my food brought to my table. My order is called by name instead of a number. To top everything off, you can have unlimited sauces with no dirty looks like at other fast food places. This sauce is thebomb.com! I can’t eat my fries without it… or my sandwich for that matter. I even use it on my hashbrowns and chicken biscuit(just a tad) in the morning. What can I say? Its delicious! My mouth does a happy dance every time it taste it. They leave you wanting more. There is nothing worse than craving some chic fila on a Sunday. Not only that, but then having to wait until after work on Monday to get some. SMH You will never do that to yourself again because it’s an awful feeling. 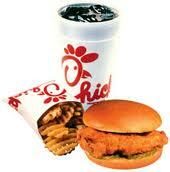 If you have any inclination Friday or Saturday that you want some chic fila, just go get some! No matter how mad you want to be with them you can’t be because they deserve a day to reverence the Lord and spend with their family too. You never see just one group of people enjoying chic fila. I feel the love when I’m there and positive energy. All smiles. There are families, friends, young, old, and all nationalities. The vibe is just completely different from all other fast food. The only thing left for me to say is that I can’t wait to one day go to the Dwarf House one day. …On my way to Chic Fila right now! 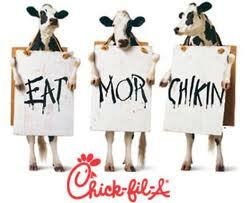 What do you love the most about chic fila? How do you eat your meal? Tell me how you feel. Spoken like a true addict lol @ the ode to Chik-fil-A!!!! !